Is MySpace worth $3 billion, or $20 billion? It depends on how you value a user. It’s time to start comparing the big global social networks on something other than unique visitors and page views. I believe an effective way to value a particular user is based on the average Internet advertising spend per person in the country they live in. The higher the spend, the more value the social network can get out of the user by serving them advertising and other products. That means that, for now, users in a handful of key countries are worth far more in terms of revenue potential than those in the rest of the world. We’ve begun to build out a model that looks at social network usage by country/region and compares that to available data on total Internet advertising spend in each of those countries. The model is then able to turn an apples-to-oranges comparison into an apples-to-apples comparison. The early results are surprising. The ultimate financial value of any asset is, ultimately, what the market will pay for it. We have only a few data points to help us: Facebook, Bebo and LinkedIn are worth $15 billion, $850 million and $1 billion, respectively, based on relatively recent valuations (although only Bebo was actually sold completely; Facebook and LinkedIn raised investments at those valuations). The last valuation of MySpace was just $580 million, back in 2005 when it was acquired by News Corp. Which valuation is most “correct?” It’s hard to say based on the data that’s been available to date, which is mostly just aggregate page view and unique visitor numbers from Comscore and other services. Based on worldwide unique visitors, for example, Facebook recently overtook MySpace to become the “largest” social network. According to raw worldwide user number, the biggest social networks are Facebook, Myspace, Hi5, Friendster, Orkut and Bebo, in that order. But when you apply the model that we’ve created below, which takes into account where users live, the rankings change substantially. MySpace is by far the most valuable social network based on available data. A competitor like Orkut is worth only 1/20th of MySpace, even though it has nearly 1/4 the number of users. Our model takes Comscore data for available countries and regions. We’ve graphed each of 26 well known social networks with the data we have been able to collect. We’ve then calculated the average advertising spend (estimated by PriceWaterhouseCoopers in a recent report) for each person online in each of those countries. For example, in the U.S., the total 2008 estimated Internet advertising spend is $25.2 billion. We’ve divided that by the number of people online in the U.S. according to Comscore (191 million), to get an average Internet spend per person of $132. View the raw data and calculations here. The U.S., by the way, is only the 4th most valuable market per Internet user, trailing The UK ($213), Australia ($148) and Denmark ($144). We’ve then multiplied the average Internet spend per user in each market with the number of unique users each social network has in that market, essentially creating a “weighted average” based on the advertising dollars chasing users. If a social network has more users in the U.S., Japan, the UK, Germany, Australia, and other bigger advertising networks, they will have a higher weighted average valuation. We believe this model is an effective way to rank various competing social networks. It bumps down networks like Orkut and Friendster who have tens of millions of users in markets with very little advertising spend, and bumps up networks with lots of users in higher value markets. Based on this model, MySpace is by far the most valuable social network. 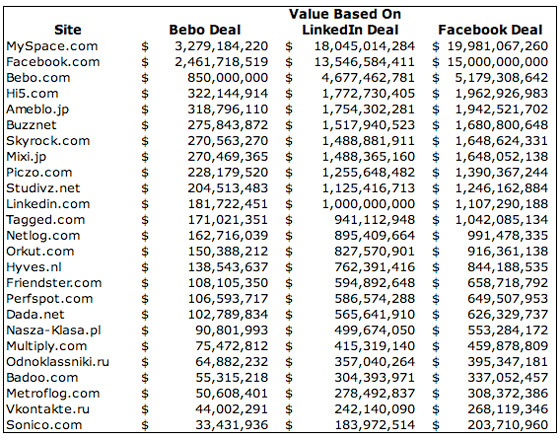 Second place Facebook has just 75% of the value of MySpace (even though it now has more users), followed by Bebo (26% of MySpace value), Hi5 and Amebio. LinkedIn comes in at no. 11, at 6% of MySpace’s value. EMarketer estimates that MySpace will post $755 million in revenue in the fiscal year ending June 30. MySpace would not comment on the estimate. About a third of the revenue is expected to come from the Google ad pact. For the year, Facebook is estimated to earn $265 million in ad revenue. Since we have three recent data points valuing social networks (Facebook at $15 billion, Bebo at $850 million, LinkedIn at $1 billion), we can start to apply valuation ranges based on the model. Facebook’s 10.2 million value points and $15 billion valuation puts a $1,467 value on each value point. LinkedIn is valued very similarly, at $1,325 per value point. Bebo, with lots of users in the rich UK market, appears to have been undervalued at only $241 per value point. Based on these three publicly available data points we’ve created value ranges for each of the top 25 worldwide social networks. There is a very wide disparity (MySpace, for example, is worth between $3.3 billion and $20 billion, based on which comparable you look at). But it does yield very interesting data. For example, If Facebook and LinkedIn were valued similarly to Bebo, they would be worth just $2.5 billion and $182 million, respectively, far less than what their investors recently paid for a piece of them. Interestingly, the recent sale of Polish social network Nasza-klasa for $92 million appears to be right in sync with Bebo’s price. The model estimates its value at $91 million based on Bebo’s valuation metrics. There are some big flaws with the model and analysis in its current state. First, LinkedIn may be in a different class of network, given that all of its users are business focused (no super-poking going on there). As a result, it may be able to monetize users far better than its competitors, no matter what geographic market is being looked at. Still, we’ve decided to leave it in as a data point, with that caveat. The model itself needs more data. The user numbers are based on April Comscore. We will shortly revise it with the May numbers, although the absolute rankings probably won’t change. More importantly, some big markets are not included yet. The Chinese Internet advertising market, for example, is estimated to be $2 billion in 2008, yet they are not included (mostly because I can’t find data on user numbers for the networks). Also, the Philippines isn’t broken out separately, again due to data availability issues (although the total Internet advertising market in the Philippines is just $3 million this year, so it won’t affect the rankings materially even though Friendster is so strong there). Finally, Russia is currently grouped with “the rest of Europe,” and needs to be separately broken out – it has a large and growing online advertising market and lots of users, so that update may affect the mid-level network rankings. The advertising spend model is just an estimate and from a single source. I’m less concerned with this data since it doesn’t matter to the model if the estimates are absolutely correct. If the estimates are wrong by different rates in different countries, however, the model will break. If we find better relative data between countries, we’ll update the model with that data. But for now, the PriceWaterhouseCoopers data seems to be pretty good. Finally, this model doesn’t take into account execution at the company level. Two very similar networks may monetize vastly differently based on methods of advertising and even the brute effort and passion of the employees. This model obviously doesn’t take that into account. I also note Andrew Chen’s analysis last week which takes a similar approach to this using Google Trends data instead of Comscore. The Google data isn’t granular enough to really dig in to relative values, however, and he was lacking current and deep data on average Internet spend. Still, I agree with his methodology. As I wrote at the very end of this post, you have to consider the current monetization value of users when comparing social networks. Raw user numbers are pointless without it.